A long, long time ago, in a land far you may remember me mentioning that we had no second floor bathroom, which is our main bath. Other than that it’s a toilet in a closet in the basement, or the third floor bathroom. I’ve actually been embarrassed about the state of our house for a long time because of this project. Well I figured it was time for an update! We still have no bathroom. On December 31, 2013 the saga of this all began with a leak dripping into our center hall, AGAIN, just above the radiator by our front door. The leak was coming from our main bathroom just above. 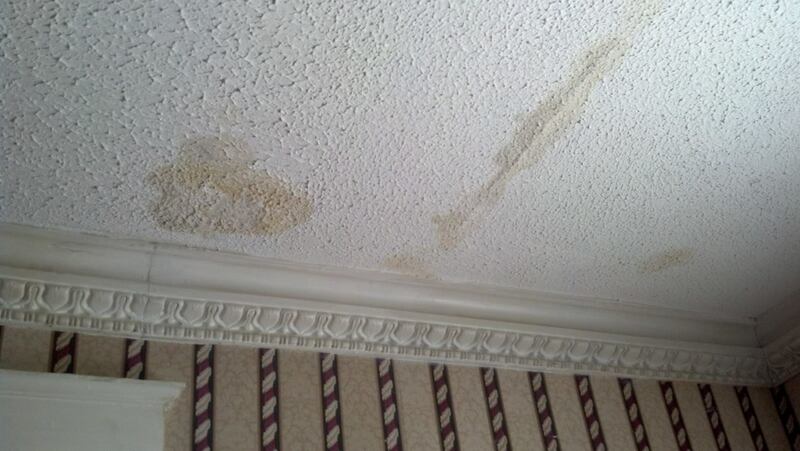 The ceiling was discolored and at the advice of a plumber who had come over when it had leaked previously and couldn’t find anything, we opened up the ceiling so we could see where the drip was coming from. No such luck. The leak happened after we showered, and was sporadic. We couldn’t replicate the issue no matter how many times we filled the tub, ran the shower, jumped in the shower…. nothing. It leaked when it wanted to leak. 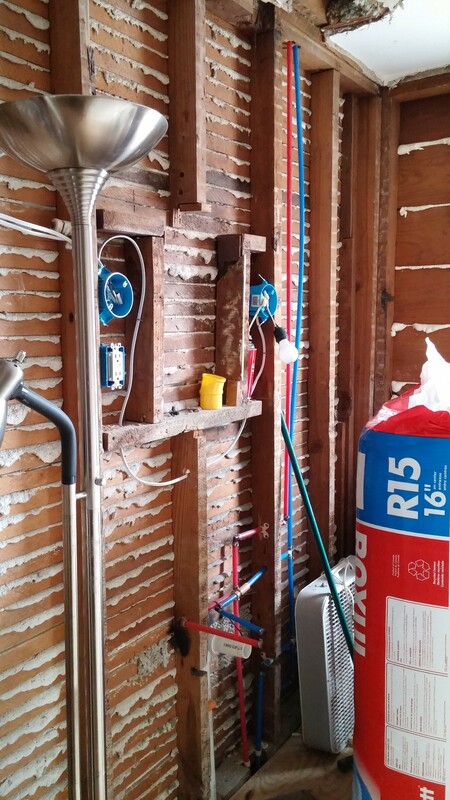 A few weeks later, Plumber X came down and gave us an estimate and asked what our insurance company had said. Insurance? The Man and I had never thought of that, but we were lucky enough to get some compensation for the damage. Because the bad news? The stack is located in the front wall of our house. THE LIVING ROOM WALL and THE GUEST ROOM WALL. Plus the hole in the ceiling. Plus the rest of the pipes were corroded. Plus all the pipes are laid in the original wet bed. All said and done, we were going to need to gut EVERYTHING. I liked our bathroom. Off white and sage green, a vanity we had updated, a cheap mirror and light fixtures that I had spray painted silver… Very simple, but in keeping with the house and it worked. We began demo in late July, early August. So now, it’s been six months, and we have nothing. New pipes, a new stack, but nothing else. Why? Because apparently Plumber X doesn’t believe in finishing the job. After demo and re-piping finished in early September, he just never came back. 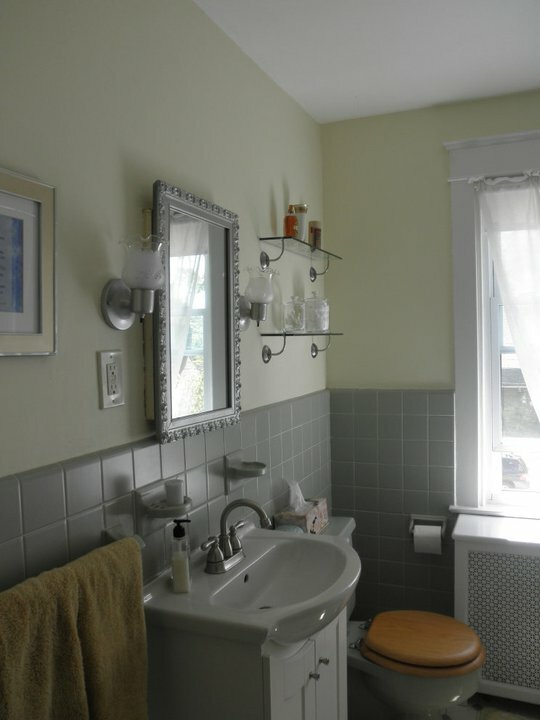 Toilet was picked, tub was picked, fixtures picked, inspiration photos shared, a layout, insulation purchased, and I had the bathroom electrical rewired. But nothing. I pestered, and in October he came back with his finishing guy so we could get a quote for dry wall in the bathroom, replacing an entire wall in our guest room (which Plumber X put an irreparable crack across doing demo), closing the wall up in the living room, relocating the linen closet, putting in a sliding door so we could have a full size vanity, and redoing the ceiling in the center hall. Measurements were taken, plans laid out, tile discussed. Never got the quote. 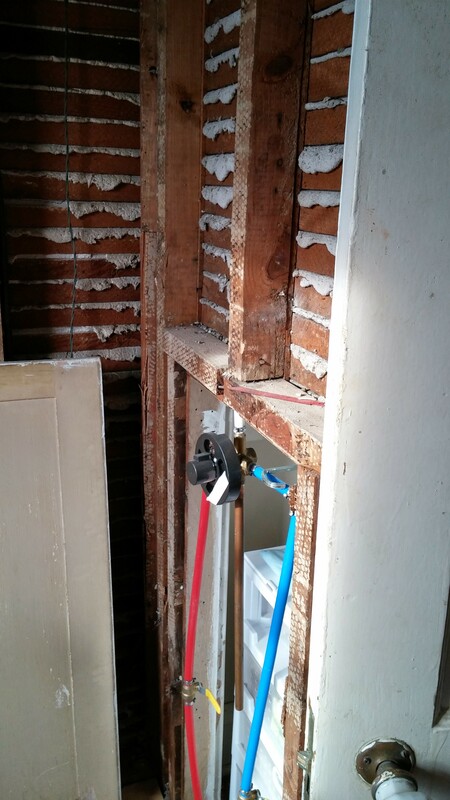 This is the wall where our vanity and medicine chest and toilet should be. A few weeks before Thanksgiving after more pestering, I told him I was having 11 people in my house for the holiday and at least needed the toilet and the old vanity hooked up. He promised it would be done and HE would do the wall repair in the living room so I could paint it because that’s where our Christmas tree goes. I also said I needed the estimate for the final work and he said no problem. Never showed, never returned calls and texted. Thanksgiving came and went. Finally mid December, and he comes over again and says he has the estimate. What he had was a wrinkled copy of the original one, and he proceeded to tick off what he had done and make generalizations about the price of what was left. I told him I was going to have possibly 25 people over the day after New Years. I NEEDED A BATHROOM. Here are the dates we’d be home, here is what we wanted, and once again not a problem. 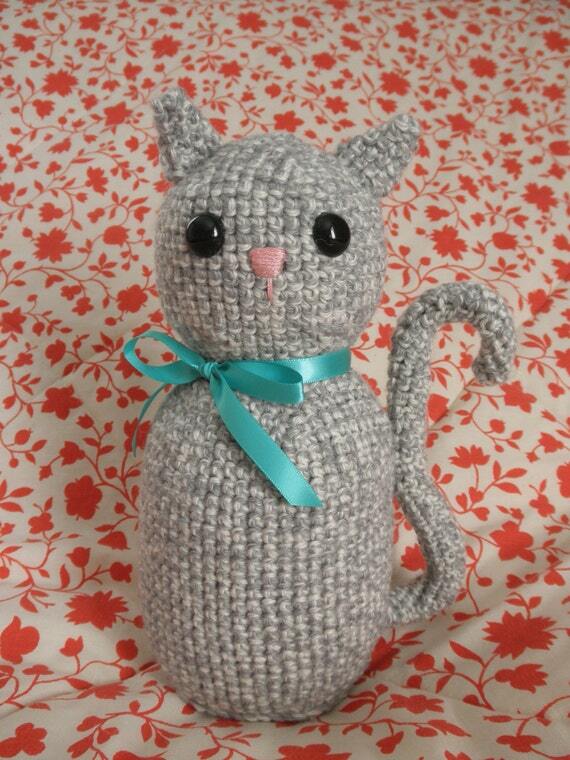 And once again, never showed. The Man finally got involved a few weeks ago and once again Plumber X promised he’d stop by. Shock of all shocks, no show. He’d get the estimate, he was meeting with the guy. No estimate. Now most of you are probably reading this and thinking, “FIND SOMEONE ELSE ALREADY!” Easier said than done. This guy lives on our street, knows our house, knows what we want, and has no problem with us leaving Abby home while he works. Plus? Abby LOVES him. Do I really want to start over again with someone I don’t know and don’t trust to leave alone in my house? I don’t have endless vacation days. 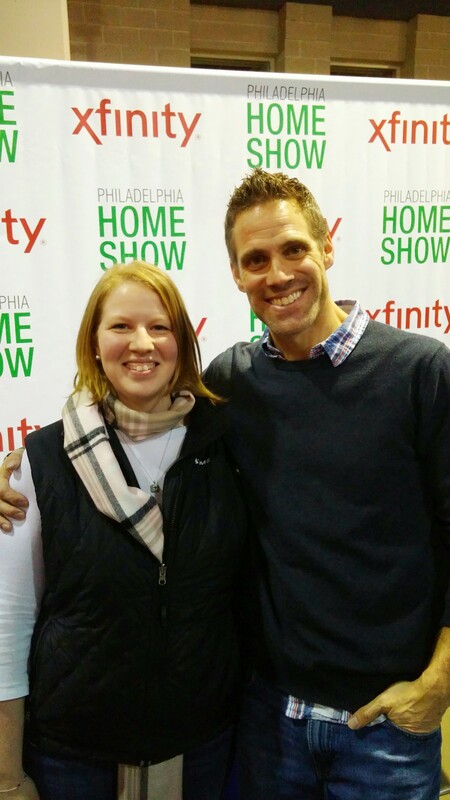 Yesterday, The Man and I went to the Philadelphia Home Show. We had gotten the tickets through Groupon, mostly because I wanted to go see Jeff Devlin from DIY/HGTV “I Hate My Bath” (and a bunch of other shows I’ve drooled over). He gave an awesome talk on some basic “dos and don’ts” of renovating. The Man and I spent half the talk laughing because all of the “don’ts”? Yeah we had basically done them. But I have to say I did learn a lot (and scored his business card!!). The major point? We screwed up, we should have done this differently, and we should have given up on Plumber X a long time ago, even if he does live 5 houses away. And what did The Man learn? That his wife TOTALLY geeks out when she meets someone she admires. IT’S JEFF DEVLIN! And yes, I currently HATE my bath.